Note: this is a review of the original 102-minute home video edit. Click here for a review of the film's 116-minute director's cut. Since its release in 1977, John Boorman’s confounding follow-up to The Exorcist has been synonymous with disappointment and bewilderment. Citing both the precipitous drop-off in quality from its predecessor and its own, inherent nonsense, critics and audiences alike were quick to pan it, relegating it to an infamous fate reserved for the true undesirables of cult cinema. Over 40 years later, any conversation about bad sequels inevitably turns towards The Heretic, an apt subtitle if there ever was one considering just how blasphemous the film is when compared to the original. And yet, time has arguably been somewhat kind to The Exorcist II: in no way would I suggest it’s some unheralded, misunderstood classic, but I would contend that other, much worse sequels released since have proven that Boorman’s film take could have ended up much worse than it did. While American horror sequels were certainly nothing new in 1977, they weren’t exactly in vogue, either, as that dam would burst a year later with the likes of Jaws II, Damien, and It Lives Again. As such, Exorcist II was essentially staking uncharted territory: just how do you move forward from a film as monumental as William Friedkin’s seminal crisis of faith horror show? Boorman (alongside screenwriters William Goodhart and Rospo Pallenberg) provided a heady, existential answer. Where the film’s producers originally wanted to mount a cheap cash-in utilizing unused and alternate takes from the original film, the director and his collaborators looked beyond such schlocky, base ambitions in an attempt to capture the existential metaphysics of The Exorcist—emphasis on attempt. Such an approach was certainly preferable (at the very least, it ensured that someone’s heart was in it), but it can be described as nothing less as a misfire. Wherever Boorman’s target was, The Heretic landed several miles astray, possibly in a neighboring county somewhere. If you squint, though, the bones of the sequel aren’t bad: rather than simply conjure up a completely new, unrelated case and slap The Exorcist title on it, Boorman proceeds from the original film in the most logical way imaginable by catching up with Regan MacNeil (Linda Blair), now a teenaged patient at a psychiatric institute. Her memories of her ordeal four years earlier aren’t even a haze; instead, she’s repressed them, much to the curiosity of Dr. Sharon Spencer (Louis Fletcher). Also curious is Phillip Lamont (Richard Burton), a devotee of the late Father Merrin’s teachings looking to clear the priest of heresy charges and confront his own doubt. If Merrin’s episode in Georgetown actually happened, he rationalizes, the devil—and, by proxy, God—must exist. In many ways, this plot sounds like it’s just retreading old ground (especially when the climax brings Regan and Lamont back to that infamous Georgetown haunt), but Boorman doesn’t exactly arrive there in a straight line. The Heretic is nothing if not unconventional, full of wild diversions and sublime imagery that’s alluring in a vacuum but comes across as scatterbrained within the context of the film. Warner Brothers did its damnedest to correct this crooked path over the years (first by having Boorman recut the film, then by releasing its own edits on home video later on), only to be left with an unruly picture all the same, full of unsightly warts that leap off the screen: Burton’s stiff, disinterested performance, hokey parapsychology, plot tangents involving locusts and James Earl Jones, and the fact that it’s just a damn strange follow-up that doesn’t feel at all a kin to its predecessor. But what’s most obvious to me now is that the central conceit really doesn’t work: at its heart, The Heretic is a mystery where we already know the answers. Lamont’s Big Questions were already answered in the previous film, meaning this one can only provide answers we don’t really need in regards to Merrin’s earlier encounters with Pazuzu (named here for the first time) in Africa. While it’s nice to see Max Von Sydow at least reprise the role, none of these sequences feels pertinent to the larger plot and only provide the sinking feeling that the most interesting character of this film is a dead man. Lamont does uncover some of his fellow priest’s interesting beliefs regarding the cosmic scale struggle between good and evil, but it’s glossed over in hurried effort to restage the climax of the original film (especially in the studio’s streamlined, 102-minute edit). Throughout The Heretic, you sense Boorman’s struggle to resist such familiarity before succumbing to it with a mystifying crescendo here that feels sort of like watching pages from your favorite book fly past your eyes as they’re being ripped from the binding. You know what you’re seeing, but it’s all been so haphazardly jumbled about that it’s just alienating and strange. Some will argue that’s enough to condemn The Heretic to the bowels of infamous horror sequels. I wouldn’t begrudge them of the argument. Personally, however, I at least respect the attempt: again, some might argue that a bad movie is a bad movie, but a weird, flailing attempt like Exorcist II at least leaves an impression, unlike so many conventional, forgettable follow-ups that have crowded the market in the years since. Boorman’s big, unwieldy swing results in a miss, but there’s a whiff of something primal and mystical lurking within its phantasmagoric imagery and Ennio Morricone’s evocative score. Whatever vitriol or ire it inspires is certainly preferable to an indifferent shrug. Maybe someone at Scream Factory agrees with me since the label has tapped The Heretic for its latest Collector’s Edition line. Even though the film has been available on Blu as part of WB’s anthology box set, this release is of note not only for its restoration and new supplements, but also for its comprehensiveness. 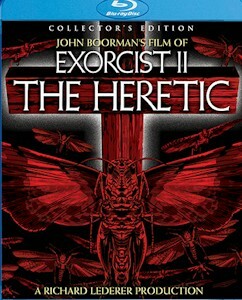 Since its DVD debut, The Heretic has only been available in Boorman’s extended, 117-minute cut, with the original home video version slipping into the dustbin of VHS-era obscurity. Scream has rescued that lost, alternate cut here with a full restoration of its own, a laudable effort if only for archival purposes since this version further hacks up an already puzzling film. With this version, it’s even easier to understand the revolt against Exorcist II: sure, it’s 15 minutes shorter and more straightforward, but it becomes exactly the sort of standard-issue sequel Boorman actively tried to avoid, one that’s even more exploitative of the original film and doesn’t try hard enough to leave its shadow with hacky still photographs and alternate takes from Friedkin's film. A shorter runtime might sound preferable by default, but with something like The Heretic, I say you go big or go home: better to witness the full, unhinged insanity of Boorman’s vision than a compromised shade of it. To that end, fans will be pleased to learn that Scream has also preserved Boorman’s director’s cut with a brand new 2K restoration, plus a pair of new commentaries with both the director and project supervisor Scott Bosco. Both Linda Blair and editor Tom Priestly appear in newly-produced retrospective interviews as well. For good measure, the second disc housing the original home video cut features a commentary of its own with The Projection Booth’s Mike White, plus an assortment of promotional materials: trailers, stills, behind-the-scenes photos, posters, and lobby cards. It seems like we say this with just about every Scream Factory Collector’s Edition, but this is the most comprehensive release imaginable for The Heretic, especially when compared to the relatively bare bones treatment Warner Brothers has bestowed upon it over the years (then again, it was one of the bigger bombs the studio ever released, so old grudges must die hard). At this point, it looks like Scream has committed itself to rescuing the reputation of this tumultuous franchise, which has endured troublesome productions with each new sequel: indeed, all three boast multiple cuts, each more infamous than last. One naturally has to wonder if Scream is set to revisit the ill-fated prequel from 2004; I'd scoff, but, then again, I did end my review of their Exorcist III disc with doubts that we'd ever see them release The Heretic, and you see how that went. We should just assume the power of Scream Factory will eventually compel us to re-buy every title in our collection--and that's fine.